somewhat frustrating. Those who are unprepared for such “entertainment” are advised to ignore these posts. There’s not been an update on the render farm lately. It sat waiting for student work, all semester. The students were not organized, and could not make any deadlines to submit to the farm. Therefore, nothing was rendered. Big disappointment, but kind of my fault really. Expecting that students would be prepared and ready with material was a big mistake. This coming semester I will make it an assignment to submit to the farm, thereby integrating it into the curriculum properly. The 2006 Mac towers continue to be a source of much fun, though. 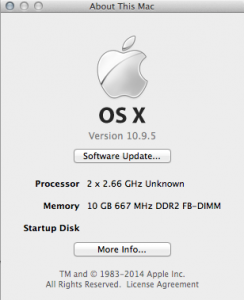 New projects to get OSX 10.9 (Yosemite) and 10.10 (El Capitan) on the old model machines have been very successful. I got the opportunity to test this out last semester for an advanced project. A little background first: at my school we have very little equipment, but we do have two Blackmagic BMCC cameras. They shoot a 2.5K image in a kind of DNG format that promises something like 11 or 12 stops of latitude. So the camera is actually shooting a folder full of image files, each one 2500 pixels on a side, each with extended dynamic range. Though the BMCC is not exactly a true cinema camera (4K, etc), it’s pretty close, and it looks sharp with a good lens on it. Unfortunately, this originating format is not so good to edit with. In fact, most computers will choke on these files. On average, most computers, even crappy laptops, can handle an image that is HD sized (1920 x 1080 pixels), but once you get to the 2K mark, most computers wheeze and begin to spark. At 2.5K, the BMCC DNG format really grinds a computer down. In an unrelated SNAFU, our school IT squad, in their infinite wisdom and without consulting our department, decided they would replace our Mac Pro towers with iMacs. And not especially souped up ones. Thus we had two cameras capable of high resolution images and no computer that could handle the data. I inherited this problem, so what did previous classes do? Apparently ignorance and willful stupidity is the law of the land at my school. Students in previous classes had a few ways they handled the crisis. Simply shoot in lower resolution, like HD size (pathetic). Hope there’s a rich kid in your class who owns a pro level setup and will do the editing (more pathetic). Burn out your own laptop trying to process the footage (ultimately futile). Halfway through the semester I was made aware that the students simply could not process dailies on the school’s computers or their own. Our department chair, once he realized, moved a few mountains to get us a Mac Pro, but until it arrived (school bureaucracy is SLOW), what to do? 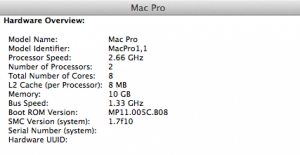 Old Mac Pro 1,1 to the rescue! I installed my own personal Radeon 5770 graphics card and made a separate startup disk with the EFI cracked Yosemite on it. A quick download of daVinci Resolve 12 and the old wheezy Mac Pro was processing their footage just fine. It was a bit slow, but it was doing it – hot, working overnight, cranking away, that error-correcting memory kicking in, pretty much doing everything the iMacs couldn’t. These same iMacs crapped out with a few layers of After Effects with various filters. They are just not production machines. Soon the new cylinder arrived, so what next? The extra machine used for daVinci was no longer needed. Why not try some other experiments? How about a processor upgrade? I had read that the old Mac Pros were the last to allow you to switch out the CPUs. Why not? Some research indicated that the humble Intel Xeon X5355 would make a good replacement for the 5250s that were in there. The big advantage was the number of cores. The 5355s had four each, making an old 4 core machine into an eight core behemoth. Doubling the power. After all, processor speeds have not improved all that much. We’re into the 3GHz range these days, but these old chips are burning at 2.66GHz – not THAT much of an improvement. Doubling the cores would be like adding a second machine on – more or less, it’s not actually that simplistic. But there’s a reason the industry has gone to multi-core to increase power. 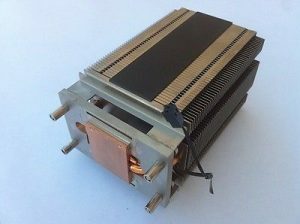 Many folks were also upgrading the processor and doing what is called the “BSEL Mod.” BSEL stands for “Bus Select,” and it is a way of overclocking the processor by either shorting out pins or blocking them with a small strip of electrical tape. The advantage to the 5355s was that since they already have an FSB of 1333 Hz (the front-side bus of these Intel chips was kind of like a throttle for data – the bigger it was, the more bits could get sent in and out of the processor) and that is the maximum the old Mac Pro architecture could handle. There would be no overclocking option. Which is sort of good, because overclocking is usually accompanied by an increase in both power consumption and heat. I’d have both anyway, but not at the same levels you get with overclocking. eBay helped me out with the chips – a matched pair for under $20. Got ’em for a song! They were just like these. Now the tricky part – the install. Luckily lots of people have done this, so a quick search provided more than I needed to know. The big thing was to have a 3mm hex driver that was over 6″ long! The processors are so hot they require giant heat sinks. They are copper plates with aluminum fans that are over six inches tall. I had to order that tool (about $4 from Home Depot, only online) and wait for that to come in. The moment it did I spent maybe 30 minutes upgrading the processors. Unscrew the sinks, unhook the sensors, lift, clean old grease off, pop off old processors, carefully place new ones, grease up the sinks, and Bob’s your uncle. The beast started up immediately. Good old “About this Mac” shows me the correct number of cores. Keep in mind that more cores is only useful for multi-threaded applications. So the increase in performance I will get will be with video and 3D rendering, which is what the farm machines are for. If I were to run lots of background processes at once, that would also be helped by more cores. But single-threaded applications would need more processor speed to show improvements. If I were now to try to do heavy Photoshop work with this machine I probably would not see any improvement at all. But for data-slinging headless boxes in an array, this is power I can use. 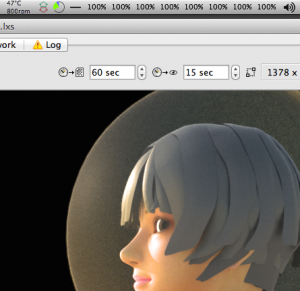 Here’s Luxrender set to 16 threads. I am using smcfancontrol and Menumeters to watch temps and control fans. That’s pretty conservative, running the fans at 800rpm and the processors at 47C, which is something like 115F. You can see all eight cores are blazing away on that image, though. It’s a test case, anyway. Will I be able to outfit the rest of the farm machines this way? Probably not. 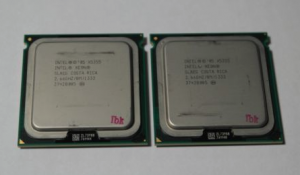 These are not my machines, and though I was lucky scoring a pair of processors so cheap, the usual cost of a used X5355 is about $20 each. Even when you buy 10 in a lot from China and they are server pulls. I don’t really have $200 I want to donate to the school for this project. If I come up with something of my own I desperately need to render, I’ll consider it, maybe. The other possibility are lower cost x5320s. These can be overclocked with the BSEL Mod, and many people have done that with great results. At around seven bucks each, this would really only be about $70 for five machines – a lot more reasonable. I can only power on about five machines at once anyway, but doubling core is like increasing the farm size to ten machines. For now I will experiment with the one souped-up machine and see how things progress.